A special thanks to those readers who have used my links to purchase items from Amazon. In case you don’t know, I get a small referral fee for anything you buy during your shopping session after you’ve clicked on one of my links—it could be a book, clothing, electronics, you name it. And since Halloween is upon us, that means that the Christmas shopping season is nigh. I mention this only because I’m striving to improve on the sub-fifty-cents-an-hour wages I get for writing this blog. I know, I know, it should be a labor of love but sometimes even love needs stoking. Risk Management: Foundations for a Changing Financial World, edited by Walter V. “Bud” Haslett Jr. (Wiley, 2010), is part of the CFA Institute Investment Perspective Series, “a thematically organized compilation of high-quality content developed to address the needs of serious investment professionals.” This is the third volume in the series. It is a collection of fifty-three reprints from such sources as the AIMR Conference Proceedings and the Financial Analysts Journal. Most of the contributions predate the financial meltdown. But if not all the contributions are timely (although I suppose that in some sense classic papers are always timely), many of their authors are or were industry heavyweights. Just to mention a few: Fischer Black, Robert Merton, William Sharpe, John Bogle, Burton Malkiel, Emanuel Derman, Clifford Asness, Richard Bookstaber, Aswath Damodaran, and Andrew Lo. This 797-page book is wide-ranging. The reader is introduced to such topics as value and risk, volatility and diversification, the uncorrelated return myth, risk management for hedge funds, managing geopolitical risks, behavioral risk, and regulating financial markets. It may not qualify as an “everything you ever wanted to know about risk management” book since it doesn’t delve very deeply into quantitative issues and since risk management is ever evolving, but it provides a solid foundation for professionals and students alike. There is no way I can do justice to this book in a single post, so I’ve decided to select two articles I think might be of particular interest to readers of this blog, both with a somewhat philosophical bent, and summarize them in separate posts over the course of the next week. The fifth edition of the Commodity Trader’s Almanac (Wiley, 2011), edited by Jeffrey A. Hirsch and John L. Person, has just been released. It follows the standard format of the Hirsch Organization almanacs; it is spiral-bound and contains two sections, the almanac proper and a databank section. The databank includes near-term contract monthly closing prices and percent changes as well as the annual highs, lows, and closes for the entire history of each product. It also provides specifications for commodities’ contracts as well as for related securities. 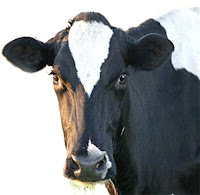 For instance, under “cocoa” we find Hershey; the individual grains reference not only CRBA and MOO but such stocks as Archer Daniels Midland, Bunge, Conagra, John Deere, Monsanto, Mosaic, and Potash. Commodities are the most seasonal of all traded instruments, so they lend themselves perfectly to seasonal studies, many of which this almanac describes. The almanac also suggests ways to improve entries, exits, and stops with pattern recognition as taught by John Person. Each month in this almanac has an overview page, and each week features a seasonal study and chart. On the weekly calendar pages the editors have added first notice, last trade, and standard option expiration days for all nineteen markets included in the book. I suppose I should mention that, as was the case last year, in addition to the thirteen top commodities the almanac also includes data on how the U.S. dollar fares against four currencies (the euro, Swiss franc, Japanese yen, and British pound) as well as the S&P 500 index futures and the 30-year Treasury bonds. As always, this almanac is beautifully produced and would adorn any desk that doesn’t already have far too many books cluttering it. This is Jason Alan Jankovsky’s third book. Last year I wrote about Trading Rules That Work and The Art of the Trade. In Time Compression Trading: Exploiting Multiple Time Frames in Zero-Sum Markets (Wiley, 2010) Jankovsky expands on his overarching premise that the winning trader sits on a trade as long as there is a secure uptrend or downtrend and then exploits changes in order flow. Zero-sum markets such as futures, options, and FOREX are a tug-of-war between buyers and sellers (as opposed to equities which are more like a game of musical chairs). Individuals win or lose depending on the actions of other traders. Time compression “is what happens when everyone wants to do the same thing at about the same time for roughly the same reasons.” (p. 51) Understanding time compression in the markets enables the trader to see when an order-flow imbalance is likely to occur. Changes in volume and open interest are tipoffs, and using multiple time frames (and not those lower time frames that losing traders tend to focus on) to discern market structure is critical. Jankovsky analyzes in some detail five basic market structures—topping and bottoming markets and secure uptrends, downtrends, and ranges—and the time/price relationships that obtain in each of them. Although time compression is the main thread of this book, Jankovsky is not a single-strand thinker. He writes about the illusion of technical analysis (though it can be useful in identifying the losers in the market and, when used with market structure and time compression, can help confirm the presence of an opportunity). He has a chapter on the psychology of initiating and liquidating a position—a conflict/resolution cycle that “happens only in the mind of traders and nowhere else.” (p. 44) He writes about how traders lose perspective and how “losing traders are attempting to predict where the market will go whereas winning traders are attempting to participate with what is happening.” (p. 85) He looks at the problem of leverage and suggests trading smaller while running a wider stop. And he exhorts the trader to think about who’s on the other side of his trade—is it someone trading size or a little fish he can swallow up? Time Compression Trading offers a refreshing perspective on the markets. It’s an easy, if sometimes repetitive, read. And although there is no magic formula for transforming a losing trader into a winner, it challenges some patterns of thinking and acting that can put a trader squarely in the losers’ camp. How can the retail investor shine in a stagnant market? Kaminsky outlines a contrarian strategy of buying or shorting against the crowd, taking advantage of a market dislocation, as long as there is a sound fundamental reason to do so. The person who proceeds in this way will be investing in a two-decision stock; that is, he must know both when to buy (or short) and when to sell (or cover). In selecting stocks that will outperform, the investor should employ a series of litmus tests to analyze potential candidates: changes in the company itself, how the company uses its cash, and company fundamentals (sustainable competitive advantage, strong financial metrics, long-term free cash flow generation, shareholder focus, and insider ownership). In addition, he should monitor the macro environment in which the company operates. Kaminsky rounds out his book by revealing Wall Street’s greatest myths, suggesting how many stocks an investor should own, and giving pointers on how to manage the downside of a portfolio. Smarter Than the Street is a quick read. It is an easy introduction for the investor who uses fundamentals to make decisions and who believes with Kaminsky that buy and hold is a strategy for mighty few stocks. The average investor who follows advice of this book should be able to improve his returns, though whether he can truly outperform is another question. In Trading Realities: The Truth, the Lies, and the Hype In-Between (FT Press, 2011) Jeff Augen ventures beyond his safe haven of option trading to take on a world filled with bogeymen. There is Ben Bernanke whose appointment “hammered the final nail in the dollar’s coffin.” There are the government number crunchers who offer data that “have been adjusted to mislead the market,” that are “fake.” And there is the “mystery buyer” who “seems to step in at key times to stop potential meltdowns.” These bogeymen, to Augen’s mind, are only too real. All is not lost. Augen claims that “smart private investors who do their homework and follow the financial markets can run with the best institutional investors over long periods of time. The simplest and best approach combines two important sources of information that everyone has access to—the daily stock chart and readily available financial news. Separately, they’re not all that useful, but the combination is much more valuable than the sum of the individual parts.” (pp. 70-71) Augen illustrates his claim with a marked-up eight-month chart of U.S. Steel. It includes analyst upgrades and downgrades, earnings reports, and macro news. Armed with this kind of information, the investor will be able to make profitable decisions, especially with regard to trend failures. In addition to his chart/news combination, Augen offers another indicator for predicting market corrections, the ratio of the VIX to true volatility. As might be expected, Augen considers stocks to be a dangerous way to invest and diversification an “overly simplistic and ineffective way to hedge. Most effective solutions,” he argues, “involve structured positions that use both options and stock, or just options alone.” (p. 191) He provides an overview of some basic option strategies. I fear that in this sweep through his book I have made Augen’s arguments appear a bit simple-minded. They are not. As he fleshes them out, they become more intriguing and more compelling. (I’m excluding the anti-Washington vent, since I find little that happens in Washington, for good or ill, either intriguing or compelling.) Most reflective readers will disagree with some of what Augen has written. That is only natural. But this brief book will most likely force them to hone their arguments—and that’s a tribute to Augen’s insights. Trading Realities provides a foundation, and rationale, for anyone who aspires to become a macro informed, volatility driven options (or hybrid) trader. And it stands as a challenge to those who don’t. For those who relish stories about trading titans, here's a piece in The Globe and Mail. This link comes via eWallstreeter, a site I found as a result of reading Gary Kaminsky's Smarter Than the Street (review to come this week). A short piece worth reading in the Financial Times: Mandelbrot tips off the markets. I’ve done a quick flip-through, and some of them look promising. Stay tuned. First came the Stock Trader’s Almanac, then the Commodity Trader’s Almanac. The latest arrival is the Quant Investor’s Almanac 2011: A Road Map to Investing by Irene Aldridge and Steven Krawciw (Wiley, 2010). It is not, let me be quick to point out, a product of the Hirsch Organization nor does it rise to the standard of the other two almanacs. The driving idea behind this almanac was to make “cutting-edge quantitative investment strategies accessible to all investors.” I suspect that few of the top-performing quants would line up to take credit for these strategies. The book focuses on economic data releases and the response of individual stocks or the market as a whole to positive and negative reports. The authors also share findings from academic papers appearing in such publications as the Journal of Finance and the Journal of International Economics. Some of the correlations to economic news should be obvious—for instance, that Home Depot stock rises in response to increases in new home sales and falls when new home sales drop. Allstate’s similar relationship to increasing and decreasing construction spending may be slightly less intuitive. Then there are the non-intuitive choices for study. To take a single example: IBM’s response to retail sales news. Why analyze IBM, which derives most of its revenue from business and technology services and middleware software? Perhaps this is why the impact of retail sales data on IBM’s stock tends to be short-lived. (I wonder how the short-term performance of IBM’s stock compares to that of Best Buy or Wal-Mart or Nike.) Those not steeped in the currency markets will also learn that positive changes in the Johnson Redbook Report lead to a drop in the Euro relative to the U.S. dollar. The authors assiduously avoid math, even tables. They do, however, provide line graphs that plot the average percentage return relative to price at announcement time on the y-axis and time to announcement (both negative and positive) on the x-axis. 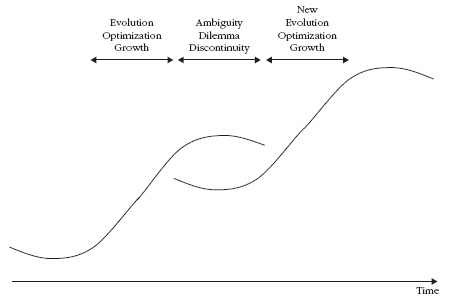 Each graph has three lines—all changes, positive changes, and negative changes. The graphs might be more helpful if we knew what time periods they covered. This book is laid out in the standard almanac style, with an events calendar on the right-hand pages and text and graphs on the left-hand pages. It also has a useful glossary. Unlike its spiral-bound counterparts, however, this almanac is paperbound, which limits its effectiveness as a desk calendar. In my opinion, if this almanac is to have a future it needs a major overhaul. First and foremost, it should be true to its title and provide quant studies, basic math included. It’s not enough to say that a stock goes up or down. The reader should be told how far it moves and how long the effect lasts. Moreover, the authors should move beyond economic reports even if this entails forcing an almanac style on non-calendar related data. After all, the cartoons in The New Yorker's highly successful desk diary are not time dependent. One of my aunts, more comfortable with results than principles, used to bring her granddaughter to the family Easter egg hunts. Over and over, as she would spot eggs that her granddaughter hadn’t seen, she would intone, “Karen Lee, open up your big brown eyes!” She thought, as most people do, that you can see what’s there simply by opening up your eyes and looking. Magicians consistently disprove this notion. Harvard psychologists quantified it. In a well-known study, they showed subjects a video of basketball players passing the ball and asking them to count the number of passes made by either the white-uniformed or the black-uniformed team. In the middle of the video one of two strange things happened, lasting for about five seconds—either a woman with an umbrella or a person in a gorilla costume walked through the center of the action. Thirty-five percent of the subjects failed to notice the woman, 56% missed the gorilla, though both the woman and the gorilla were obvious to anyone not engaged in the counting task. Count the bars, recognize the pattern, and—oops—miss that gorilla in the room. Or broaden your focus so that you at least see the gorilla, and then decide whether or not it’s relevant. The final takeaway for this two-part post on Deep Survival comes from the theory of risk homeostatis, which says that people accept a given level of risk. “While it’s different for each person, you tend to keep the risk you’re willing to take at about the same level. If you perceive conditions as less risky, you’ll take more risk. If conditions seem more risky, you’ll take less risk.” (p. 112) For instance, when antilock brakes were introduced, the expectation was that the accident rate would be go down. In fact, it went up because people figured that driving was safer with the new brakes so they drove more aggressively. I make it a policy never to review a book until I have finished it. In the case of Probability and Statistics for Finance by Svetlozar T. Rachev, Markus Höchstötter, Frank J. Fabozzi, and Sergio M. Focardi (Wiley, 2010) I feel compelled to make an exception. The fault lies not in the book but in the reader. Although I am progressing at a reasonable clip given some of the gaps in my math background, I decided that it would be unfair to the authors to wait until I had read the last part of the book, multivariate linear regression analysis. So I’ll confine my brief remarks (brief, lest I demonstrate to the world that I really am a quant dolt) to the first three parts: descriptive statistics, basic probability theory, and inductive statistics. That’s 518 of the 632 pages of text and appendixes, so although it’s not a representative sample it’s a pretty good chunk. No book on statistics is complete without considering the formulation and testing of hypotheses. This section is surprisingly dense mathematically, which is where I got bogged down. Probability and Statistics for Finance is not for the casual reader who comes from the “physics for poets” school of thought. It can be tough sledding. But for anyone who is serious about gaining a solid foundation in quantitative analysis this book is a very good place to start. On the recommendation of one of the readers of this blog I borrowed Deep Survival: Who Lives, Who Dies, and Why by Laurence Gonzales (W. W. Norton, 2003) from the public library. It was not a book I thought I needed in my permanent collection because, as I readily admitted in my post "Trading and alpine climbing," I’m not the sort who spends her weekends climbing mountains, running rapids, or snowboarding. But even I, the non-adventurer, found the book intriguing. After all, one question all traders should ponder, and ideally have an answer to, is who survives, who fails, and why. Although Gonzales devotes the lion’s share of the book to recounting tales of disaster and survival, he regularly steps back to dissect what gets people into trouble in the first place and what separates the survivor from the victim. Over the course of two posts I’m going to look at a couple of things we do to put ourselves in harm’s way and how we can survive our own bad instincts. We are inveterate planners. Plans, as Gonzales sees them, are not simply some emotionless ideas we write down on a piece of paper; they are suffused with the emotional values of past realities—earlier climbs, former trades. These memories are “beacons of incentive.” We apply our memories of successes, good feelings, favorable conditions to the new and unfamiliar challenge. We must abandon the plan even as we confront unexpected turns of events and additional stresses—and hence find it difficult to think clearly. Reason can easily be overwhelmed. How do we revise the script and learn to adapt? Rigorous training is critical—“not only in the technical stuff … but in emotional control. All elite performers train hard, and when you follow in their path, you’d better train hard, too, or be exceptionally alert. That’s the main difficulty with neophytes who go into the wilderness: We face the same challenges the experts face. Nature doesn’t adjust to our level of skill.” (pp. 87-88) Nor, of course, do the markets. A footnote: Gonzales more or less equates letting go of a plan with breaking rules when he looks at patients who have in effect been handed a death sentence by their doctor. (“The plan … can become the equivalent of doctor’s orders, the tyrannical rule you can either obey or rebel against.”) People who survive cancer are notoriously “bad patients.” They are “unruly, troublesome. They don’t follow directions. They question everything. They’re annoying. They’re survivors.” (p. 82) I’m not sure that the equivalence holds or that we want to adopt the cancer survivor model wholeheartedly when it comes to trading. Nonetheless, experienced traders know that money is often not found where the compass points. Sometimes it’s refreshing to step back from all the current political folderol and read about a time when American economic and political systems were being developed. Let me recommend Robert E. Wright’s The First Wall Street: Chestnut Street, Philadelphia, and the Birth of American Finance (University of Chicago Press, 2005). It’s not a new book, but the recent financial turmoil makes it an even more worthwhile read today than when it was published. Readers of all political stripes can find some eerie parallels here and there. In contrast to most books on finance, it’s also very well written. This post will share a series of (unfortunately disconnected) snippets from the book. They don’t do the book justice, but maybe they’ll inspire readers interested in financial history to turn to the original. As the leaves change color we not only savor the glorious sight but look forward to 2011. Once again, for the forty-fourth time, the Hirsch Organization offers us the Stock Trader’s Almanac (Wiley, 2011). Under the editorship of Jeffrey A. Hirsch, the almanac continues its familiar format. Spiral bound, printed on sturdy stock, and now 192 pages long, it includes a calendar section and an index data section. On the recto pages of the calendar section are entries for a week, including the market probability numbers each day for the Dow, S&P 500, and NASDAQ as well as historical performance highlights and quotations. On the verso are well-documented studies. The almanac’s prediction of Dow 38820 by 2025 may be a little over the top, though it certainly would be loverly. The case for this forecast presumes that we exit Iraq and Afghanistan in a timely fashion, that we begin to experience inflation, and that enabling technologies such as energy technology and/or biotechnology create “major cultural paradigm shifts and sustained prosperity.” (p. 36) Alas, don’t expect a straight line to this target; if the market follows the pattern of 1974 through the first half of 1982 we may be in for another seven relatively lean years before takeoff. The CANSLIM enthusiasts, and they seem to be legion if the reviews on Amazon are any indication, have nothing but praise for Trade Like an O’Neil Disciple by Gil Morales and Chris Kacher (Wiley, 2010). I decided to be a little more focused and less ebullient in this post and write about a trade setup not found in the standard O’Neil repertoire. Consider this a follow-up to yesterday’s discussion about the eye of ambiguity. The setup is alternatively described as a pocket pivot or buying in the pocket. It is “an early base breakout indicator, which is designed to find buyable pivot points within a stock’s base shortly before the stock actually breaks out of its chart base or consolidation and emerges into new high price ground.” (p. 128) The pocket pivot indicator provides direction in what might be seen as an ambiguous situation. It is, the authors claim, particularly valuable in sideways moving markets. Futures Magazine, use quantitative methods to find profitable option trades. In Systematic Options Trading: Evaluating, Analyzing, and Profiting from Mispriced Option Opportunities (FT Press, 2010) they introduce the reader to techniques by which to calculate the difference between the market price of an option and its fair value. This difference represents a trading opportunity. Izraylevich and Tsudikman develop a series of criteria to evaluate and compare individual options and their combinations; the higher the criterion value the better the profit potential. The primary criteria they use are: expected profit on the basis of lognormal distribution (EPLN), empirical distribution (EPEM), and symmetrized empirical distribution (EPES); profit probability on the basis of the same three distributions (PPLN, PPEM, and PPES); the ratio of expected profit to loss based on these distributions (RPLL, RPLE, and RPLS); the ratio of implied to historical volatility (IV/HV), and the break-even range (BEVR). Although most of the criteria, taken individually, “show statistically reliable predictive power, in most cases it is rather weak. Nevertheless, this small forecasting effect gives a considerable advantage to those who use it over those who ignore systematic criteria application. … Concurrent utilization of many criteria allows exploiting different individual advantages inherent to each of them. The cumulative synergetic effect of such a multifaceted approach is expected to be quite noticeable.” (p. 182) It is, of course, critical to measure the correlation between different criteria when pursuing a multicriteria strategy. The reader who wants to replicate the authors’ work at home or expand on it will need, at the very least, an end-of-day database of option prices. A solid foundation in statistics and probability theory is also a prerequisite. And without some programming skills all those numbers (I just experimented with a sample download—a single day of strike prices for U.S. equities fills some 300,000 lines in an Excel spreadsheet, which is of course not where the data should be housed) will be unmanageable. The ill-equipped or lazy reader can go to the book's website for daily updates on trading opportunities using single criteria for straddles and strangles, calendar spreads, butterflies, and condors. Many thanks to Bill Luby of Vix and More for the kind words about this blog. He also found the video links to the Engle mini-lectures, so those who want more than my notes and graphics can now have the whole shebang. For those whose life is not complete without reviewing economic graphs here are a couple you may not have seen: monetary policy decisions (Australia, Indonesia, Japan, Europe, UK, Philippines); U.S. non-manufacturing PMI, consumer credit, and nonfarm payrolls; and Australian employment. Compliments of Econ Grapher. This is the final installment of my notes on Robert Engle's FT lectures. As I wrote earlier, the transcripts of these mini-lectures are available on the FT website. The larger the stock market (i.e. the more companies listed) the lower the volatility. The faster the GDP is growing, the lower the volatility. When GNP is declining, the volatility will rise. When you have high inflation rates you tend to have high volatility. When there’s a lot of fluctuation in short-term interest rates or short-term real output this macro economic volatility contributes to financial market volatility. Traders, especially discretionary traders, have long recognized the importance of psychology to their endeavor—trying to fathom not only what’s in their own heads but what’s in the heads of those on the other side of their trades. As a result, there is a fairly extensive bibliography of books and articles on trader psychology. Not so with investor psychology, at least not outside the world of academe. Richard L. Peterson and Frank F. Murtha, co-authors of MarketPsych: How to Manage Fear and Build Your Investor Identity (Wiley, 2010), seek to help fill that void. The authors, by training a psychiatrist and a psychologist, are also the co-founders of MarketPsych LLC, a company that “trains financial advisors, portfolio managers, traders, and executives in emotion management and intuitive decision skills.” Its website offers free personality tests for investors and traders. Throughout the book the authors draw on the findings of research in behavioral finance. For instance, in one chapter the authors identify ten investor blind spots (or mental traps), some of which should be familiar to those who have read (or read summaries of) the work of Kahneman, Tversky, Thaler, and their colleagues and followers. The traps are: win/lose mentality, down with the ship syndrome, anchoring, mean reversion bias, endowment effect, media hype effect, short-termism, overconfidence, herding, and hindsight bias. The authors profile hypothetical investors, each of whom falls into between two and five of these traps. We meet the Wicked Gardener, Corporal Clinger, Mr. Magoo, the Roulette Player, and Maxwell Smart. Let your imaginations run wild trying to match them up! MarketPsych offers case studies, exercises, planning templates, and down-to-earth advice. All are designed to take the investor from being an underperformer to being an achiever. And for those who think that being average is good enough, here is a stunning statistic. $100,000 invested in the S&P 500 index on January 1, 1989, would have grown to $292,329 by 2009, after accounting for inflation. The average equities investor, by contrast, would have ended up with $82,288 over the same 20-year period! I personally didn’t learn a great deal from this book, but then I’ve read thousands of pages on behavioral finance and trading psychology. For those who need help managing their investing selves but have no intention of ensconcing themselves in the library or laying out countless dollars, MarketPsych is a quick yet wide-ranging 240-page read. Back when I received the galleys of this book I wrote a post entitled “Who Was Adam Smith?” Now that Nicholas Phillipson’s Adam Smith: An Enlightened Life (Yale University Press, 2010) is being officially released today it’s time to revisit the book. First, for those who care about such things, it’s a handsomely produced book—from the coated dust jacket to the color plates to the sewn binding. Second, and of course much more important, the work is skillfully crafted. Phillipson not only explores the interconnectedness of Smith’s moral, political, and economic ideas; he also demonstrates that the Scottish Enlightenment was far more than a backdrop for Smith’s work. I have teased but a single thread from Phillipson’s sympathetic yet balanced portrait of Adam Smith the man and the thinker. It’s an opulent biography. Scott H. Fullman’s Increasing Alpha with Options: Trading Strategies Using Technical Analysis and Market Indicators (Bloomberg Press, 2010) is not a book for option traders. Its intended audience is money managers who want to improve their equity returns and smooth out their P/L curve by adding options to their portfolios. The strategies are sufficiently elementary that I see no reason the individual investor couldn’t learn from Fullman’s book as well. That said, the investor or money manager who wants to implement any of the author’s strategies should have a solid understanding of option fundamentals, which this book was not designed to provide. A foundation in technical analysis would also be a plus. Fullman concentrates on directional option strategies--calls and puts (and he’s not squeamish about being naked) and vertical spreads. He outlines a series of scenarios in which it could be advantageous to buy or sell options rather than stock, to replace stock with options, or to hedge a stock position or a portfolio with options. Here are a couple of examples that use simple option strategies in not so simple ways. The first is a pairs trade that keys off of the relative strength of stocks within an ETF. Assume that you own XLB, the materials ETF, and that it is outperforming the S&P 500. Of the ETF’s 29 component stocks IFF, a former leader, is experiencing weakening relative performance and its momentum is turning lower. Consider the following two possible trades, both seven weeks to expiration. First, with IFF at $30.48 buy the 30/25 bear put spread on IFF. Second, write 30 strike IFF calls. A variation on this theme occurs when a sector “appreciates past the point at which its initial leaders begin to lose upward power, pushed by lagging stocks that often appreciate for longer than the leaders—though not necessarily for an extended time period.” (p. 97) In this case a fund manager could sell the XLB stock and buy a call on a laggard in the ETF. One of Fullman’s favorite strategies is the covered combination in which “managers use a margin account to purchase between one-quarter and one-half of the manager’s normal position in the underlying shares, then write an equivalent number of out-of-the-money calls and out-of-the-money puts.” (p. 81) This strategy makes money if the stock goes up or remains unchanged. If the stock drops below the strike price of the put and the contract is assigned, “the manager buys the remaining one-half or one-quarter of the position, depending on the number of contracts sold, yielding a lower average purchase price than that offered by the stock’s original value.” (p. 82) Of course, some people would consider this an example of the often dangerous practice of doubling down. Readers of books on investing and trading often complain that they are long on theory and short on practice. Fullman’s book offers specifics. It’s up to the manager to decide what kinds of strategies fit the risk profile of his fund and what he personally is comfortable with. 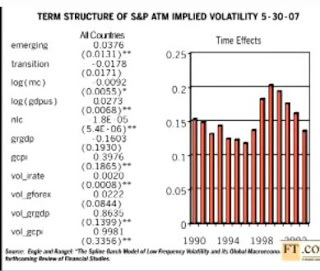 When we are measuring volatility using the GARCH model we’re using high frequency data. This measures only short-term volatility—over the next few days, for instance. 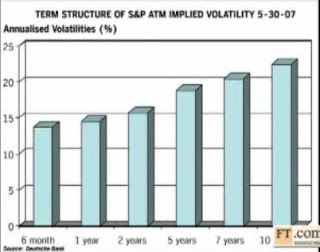 The options market, using implied volatility, estimates volatility over various time horizons. 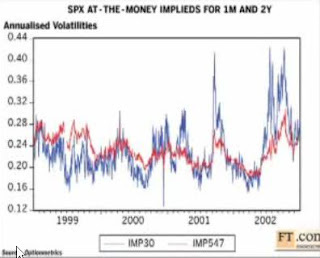 The two-year volatility measured in red versus the one-month volatility measured in blue oscillate—sometimes short-term volatility is predicted to be higher than long-term volatility, sometimes lower. The above graph shows the period between 2004 and 2005. 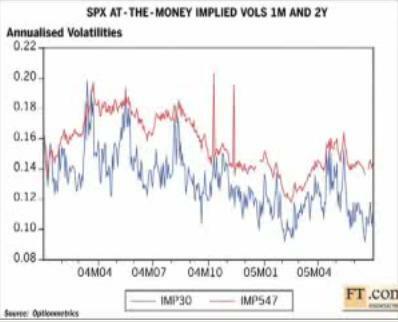 Here the long-horizon volatility in red is much higher than short-horizon volatility. This disparity is even more pronounced if you look at longer-term options which are traded only OTC. What is the implication of having long-run volatility so much higher than short-run volatility? For one thing, the sophisticated investor is not going to put money into the market under these conditions because the odds of losing money in a higher volatility environment are greater.